What happens when the very gods depend on mortals for help? That's what three very different young women find out when they are invited to Warrior's Peak. Light and Knowledge have succeeded in their quest, and two of the keys have been found. The final, and last, test goes to Zoe McCourt - Valor. Zoe has the courage to raise her young son alone, and to face all the adversity life has thrown at them. But will she have the courage to face a foe determined to do anything to stop the third key from being found - even destroying everything - and everyone - she loves? Loved all three books, I couldn't wait for this last book and have enjoyed listing to the whole story. I really enjoyed this book, not only suspenseful, but I enjoyed the magical mystical component of the book! A great read! Interesting. I liked the entire trilogy and getting to know the individual characters on a more intimate level. It is a light listen no stress. Worth reading for some light entertainment. Especially enjoyed listening to it in my car. This was a wounderful series: I enjoyed each woman's journey. The ending was great. I look forward to reading more of Nora Roberts' books. I enjoy Nora Roberts, I especially like her books when she talks about witches and such. Keep them coming. 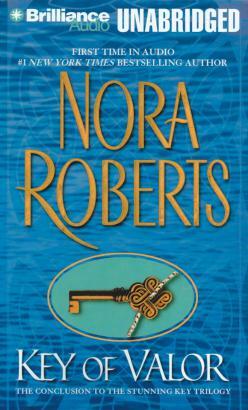 This is the final book in Nora Roberts Key Trilogy. It is a great ending to a wonderful series. Loved the characters and the happy ending. I highly recommend this book and author to anyone who enjoys Romance Novels. It would be best to follow the trilogy in order. Happy Listening!! Definitely worthy of 5 stars. For those of us who enjoy just a touch of the supernatural thrown in with our mysteries this book is a must read. Chocked full of romance, lust and adventure this is also a story of love, trust and responsibility. It'll go on my "read again" shelf and I bet it would your's too. You'll be missing out if you don't read this one but it's part of a trilogy so read them in order.